An early season fruiting (July) variety producing fruit of good size and excellent flavour. A vigorous, upright habit growing to 1.5m (5ft) but also compact and not too spreading. Patriot is reputed to have some resistance to root rot diseases, making it a good choice for heavier soils. Brilliant orange-red autumn leaf colour. Comments: superior flavour, very hardy. My whole experience of Trehabe nurseries has been fantastic. The gentleman spent a long time on the phone to me (blueberry newbie) giving me advice. The beautiful plant arrived within 5 days and it looked incredibly healthy with flowers on already, it was the best packaged plant I have ever received. Thank you again and I will definately be using you again and recommending you! Received very soon after ordering and in immaculate condition. Lots of flowers. 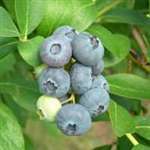 The Blueberry plants arrived promptly and in perfect condition. Thank you all very much from a very satisfied customer. A perfect plant, perfectly packed. I have previously bought a Camellia from Trehane which was also perfect - not a blemish on any leaf. I have not had the opportunity to visit the nursery but it is clear that they set themselves high standards both in the nursery and in customer service.